I recently found these and decided to buy them because we had never tried them before. I was also going to say wasabi peas, but they look a bit lighter in color. 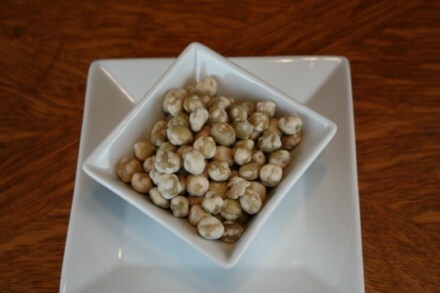 My husband LOVES wasabi peas! Wasabi Peas! My husband accidentally got a few in his handful of Oriental Trail Mix as we were driving down the road. He HATES wasabi..so he opened the door, and spit them out–as we were MOVING! LOL! I think they look like carmel popcorn…but the other ladies are probably right. I think they are macadamia nuts. 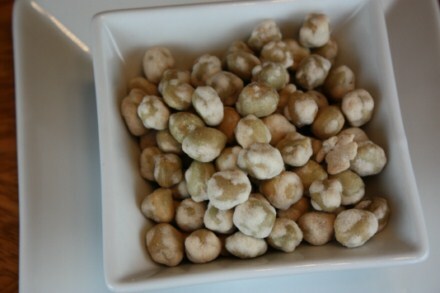 They look like macadamia nuts to me, but I’ve never heard of these wasabi peas that the others are talking about. I have not a clue. Macadamias are quite light in color. So I don’t think that is right, and i have no idea what wasabi peas look like so I can’t make a call on that. They look like wasabi peas to me…yum. they look like wasabi peanuts or peas. Trader Joes’ used to have some wonderful wasabi peanuts–I miss those! THEY LOOK LIKE MACADAMIA NUTS, BUT ARE NOT UNIFORM IN SHAPE. WASABI PEAS USUALLY ARE A DARKER GREEN. THIS HAS ME STUMPED!! I say that they are macadamia nuts, Wasabi peas look very similar but are coated with a colored substance that gives them distincted flavors – green is horseradish flavored. Wasabi peas are the best!!! Whether they are green on green, white on green, or something in between…. I love them! I am alergic to capsacin (sp), the stuff that makes peppers hot. But wasabi is not a pepper, but a root. It is Japanese horseradish! Have I mentioned that I love these things? !